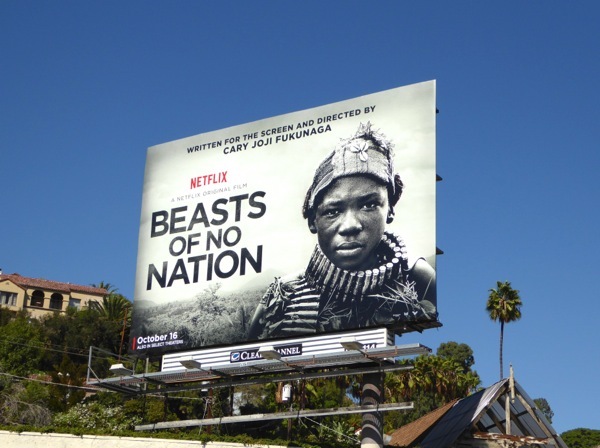 Not content to take on the world of television and take home four Emmys at this year's ceremony, it looks like Netflix is setting its sights on the Oscar race with Cary Fukunaga's original African war drama, Beasts of No Nation. 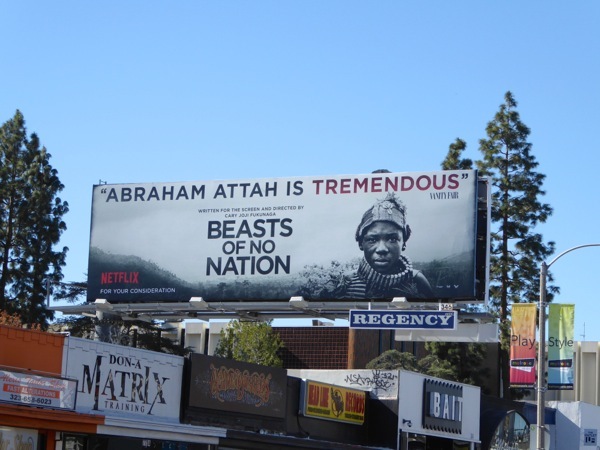 Not only is the 137-minute film available to stream on Netflix, but the movie also enjoyed a limited release in specialist cinemas and continues to be supported in the skies of L.A. with a super-sized billboard along the Sunset Strip. 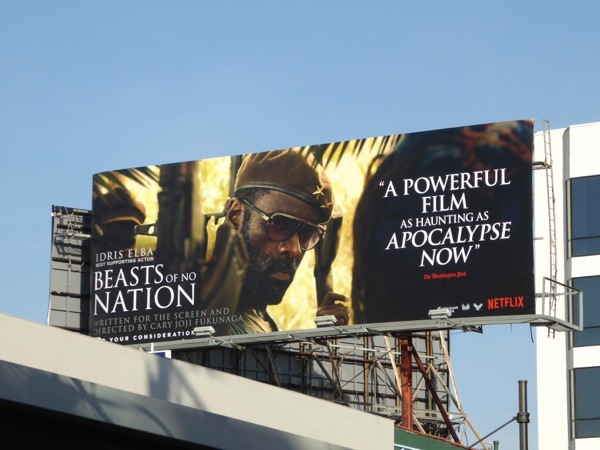 Idris Elba stars in the harrowing and though-provoking drama about a young boy named 'Agu' (Abraham Attah), who is forced to become a child soldier in a war torn West African country. 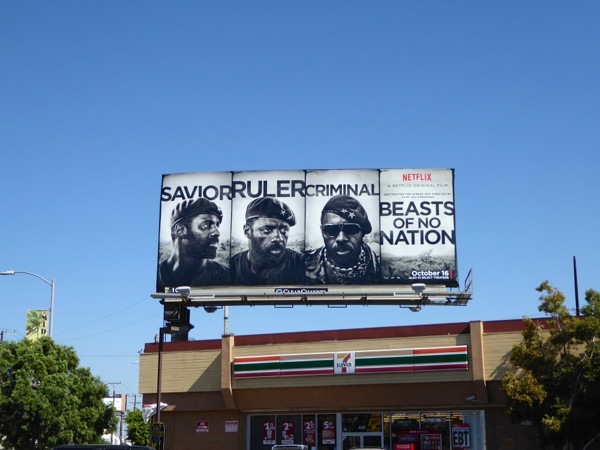 The outdoor campaign cleverly shows the boy's journey from innocent child to captive, to trained killer, by his warmongering troop Commandant who could be perceived as a savior, ruler or criminal, depending on your point of view and circumstances. 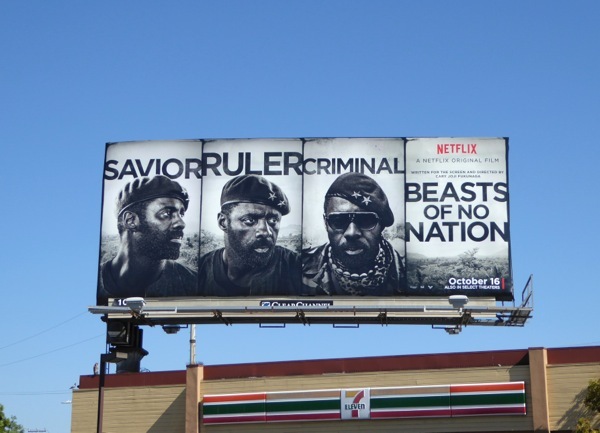 The Netflix billboards and street posters for the original movie were snapped along Pico Boulevard, La Brea Avenue, Sunset Boulevard and Highland Avenue from October 9 to October 21. 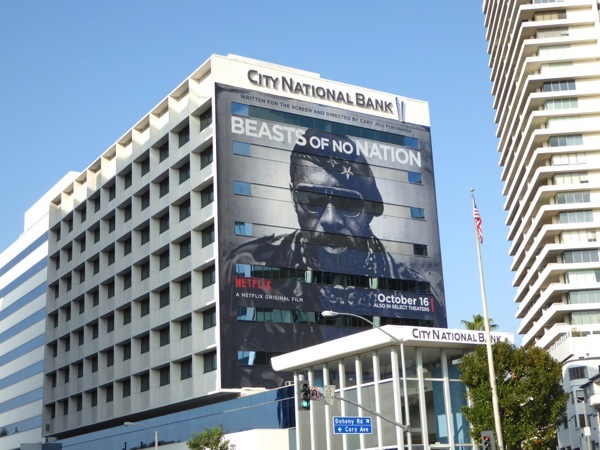 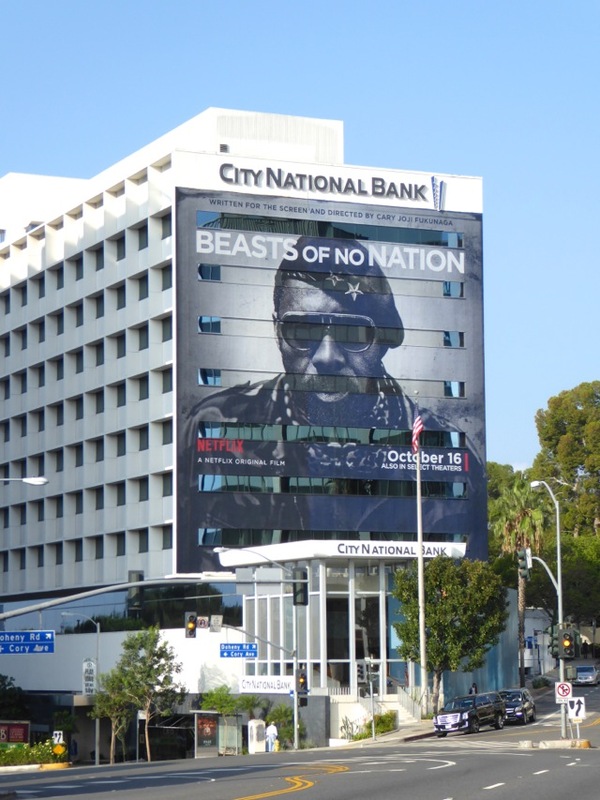 Meanwhile the imposing giant-sized Idris Elba billboard for Beasts of No Nation was photographed at the start of the Sunset Strip in West Hollywood on the border of Beverly Hills on October 17, 2015. 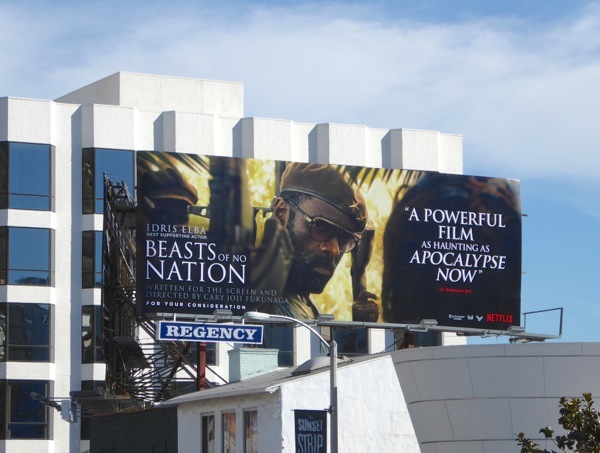 If you're a fan of the actor, be sure to also check him out in these No Good Deed movie billboards and this cool Tanqueray Gin billboard. 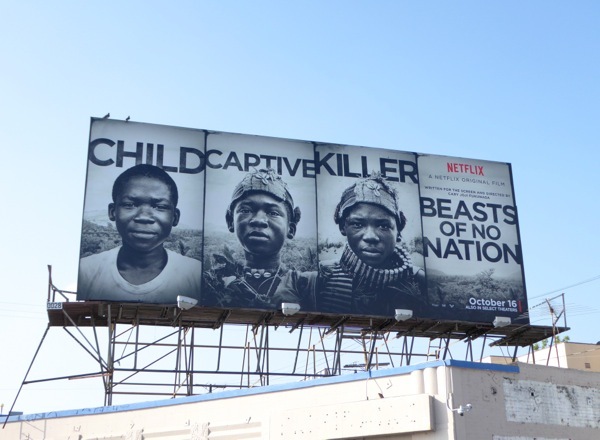 Netflix has enjoyed Academy Award nominations for its documentary films, The Square and Virunga, but can they extend their reach into the feature film and acting categories with Beasts of No Nation. 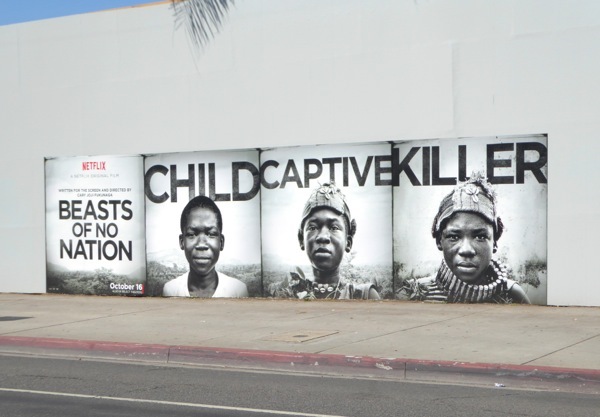 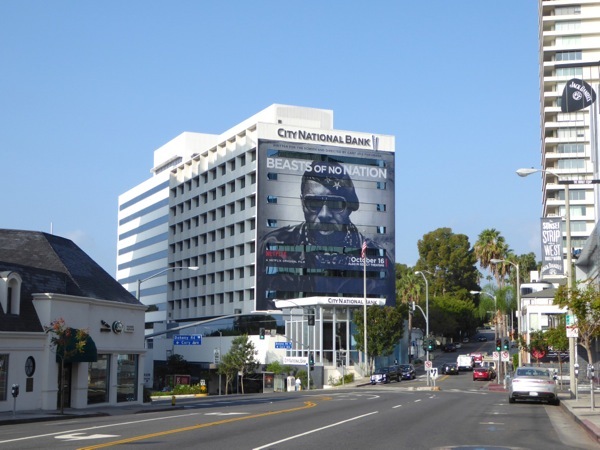 UPDATED: The giant-sized billboard for Beast of No Nation along the Sunset Strip may have come down, but Netflix has just kicked off its awards campaigning with these new billboards for Idris Elba and Abraham Attah. 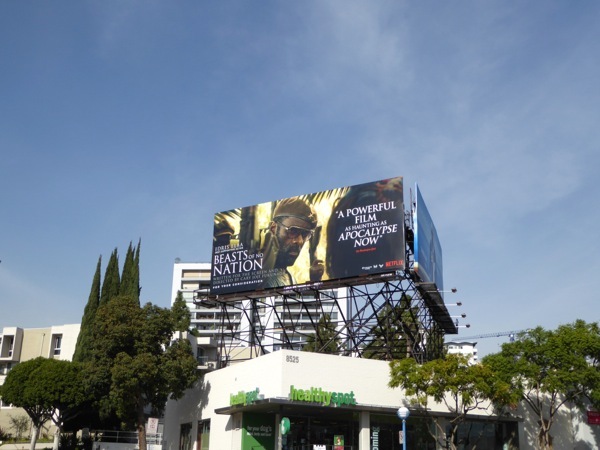 These 'For your consideration' billboards were snapped along Melrose Avenue and Wilshire Boulevard on November 19, 2015. 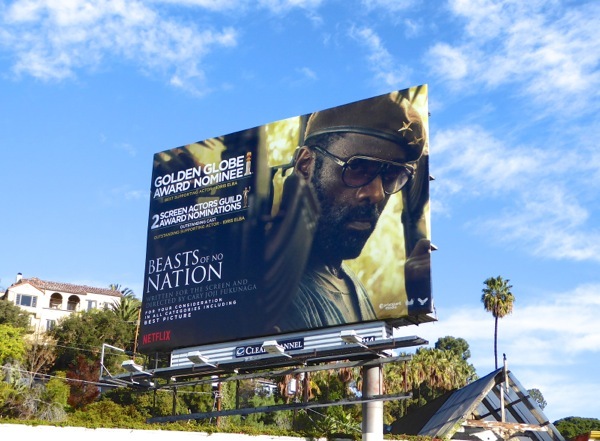 Plus here's another billboard featuring Idris Elba along the infamous and heavily travelled Sunset Strip on November 23, 2015. 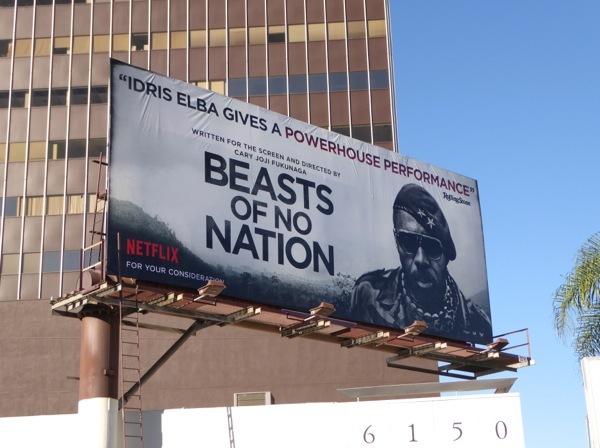 UPDATED: It's all kicking off for awards season, as here's also a very different 'FYC' ad creative for Idris Elba as Best Supporting Actor, spotted along the high-profile Sunset Strip on Dec 2, 2015. 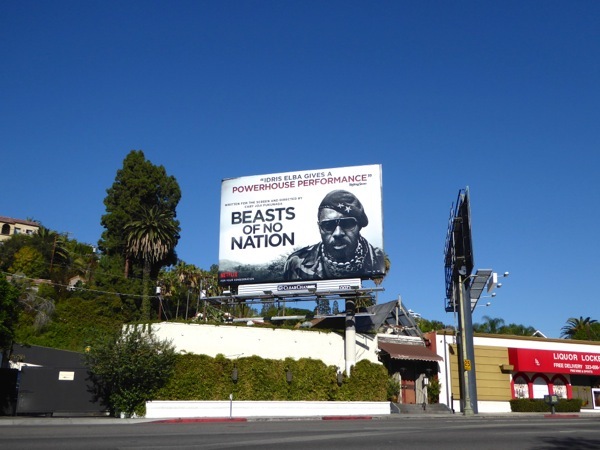 Plus here's another billboard example along Santa Monica Boulevard in West Hollywood on December 8, 2015. 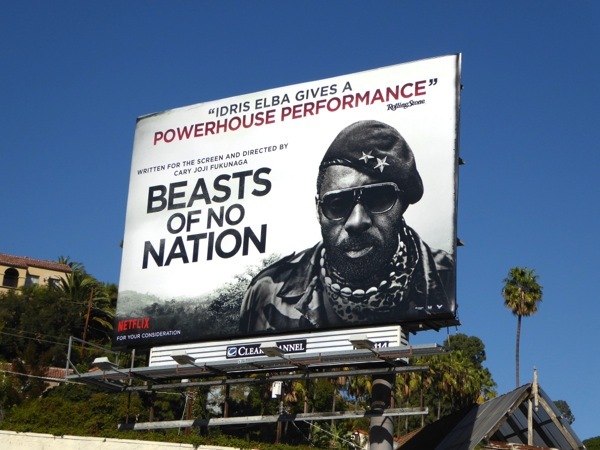 UPDATED: The support continues for 'Beasts' with these awards nominee billboards for the film's Golden Globes Best Actor nomination and two Screen Actor Guild Award nominations for Outstanding Cast and Best Actor for Idris Elba. 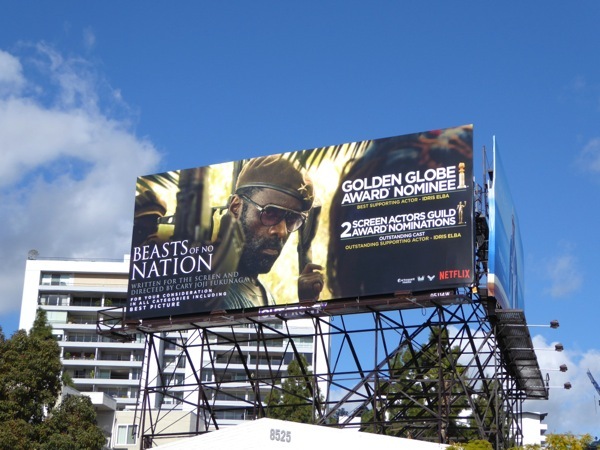 These awards nominee billboards were snapped along the Sunset Strip and Santa Monica Boulevard on January 7, 2016 respectively.